Hu? You don't? Hmm... What if I tell you that I'll learn how to do a formatted text viewer in QB, and that I promise It'll be a series? Aahh... I knew you would say yes then! So what are we waiting for, let's get started! Oh whatever, I'm sure you'll come up with something. and read the real text? try, cause indeed there is one. Mind you that none of the lines exceeds 40 characters, 'cause our first text-viewer will not support linebreaking. Now, cut and paste it into notepad, and save it in the same dir as you plan to be coding you text-viewer. From now on, I will be referring to that dir as the viewer dir. ... were we will be using DQB for the ease: We don't need first to make our own font, graphics, and page-flipping routines! YES! Make sure that you know have a copy of the DirectQb lib, compiled with all routines (for MY ease), in your viewer dir. The viewer dir should now contain the following files: MyBrain.txt, DQB.Lib (if you'd like to compile), DQB.Qlb, and DirectQB.Bi. The first line includes the DirectQB include file, with the DECLARE statements for the lib. The next, DrawScreen, will be called to update the screen (to Layer 1, mind you), its argument, update%, tells the sub to, or not to, copy Layer 1 to the real screen. The others should be self-explaining, if you don't think so you will understand the subs later on. File(1 to 2048) is the STRING array were we will store the file at run-time. TopLine tells us what index in the File array that is the topmost one on the screen. Will be needed to know were to start printing, in the sub DrawScreen. NumOfLines tells us how many lines there is in the file, so we can find were to stop the user from scrolling further. this calls the subs, which will be explained later. I know it's not the best way, but it'll work fine here. Key number 73 and 81 is PgUp and PgDown, respectively. The quit var is set if we want to quit. this is pretty simple: if the change var is set, we reset it and update the screen. Of cause the program won't run yet, as we're left to do the subs. First three lines draws the background, next we print the title (put anything you like there), and then some helpful text at the bottom. Then we set the start pos for the text (eleven pixels from the top, here), and then print seventeen lines of text. Lastly, but not less, we update the screen, if we're told to do so, mind you. First we call DQBClose, which closes DQB and removes the keyboard handler. Next we... Oh forget it! You know what that does, right?! if DQBinit(1, 0, 0) THEN PRINT "Internal Error, aborting program"
this loads the file, and sets the NumOfLines var. Copy & Paste this into NotePad, and save it as QFTView.bas in your Viewer dir . Run it, and change the ScrollDelay to anything that fits on you PC. The reason why we have to check if the ScrollDelay var is greater than or equal to one, is because if you call DQBWait, which waits for vertical retrace, with eg. a value of 0.3 it'll wait for vertical retrace under 1 times, which is impossible. If you anyway do this, you'll end up with a locked computer. He'll rather choose to download another text viewer, than have to download QB, change the vars to fit etc. The solve to our problem, is to use the built-in COMMAND$ variable, which returns the parameters shipped with the command-line. PRINT "QFTView -? | FILENAME.TXT [-dSCROLLDELAY#]"
PRINT "Will display the file somefile.txt and set the scrolling delay to 15"
I don't like to explain all this, so if you don't understand it, accept it. I have some small remarks to do, though: The CheckArg: line is for future usage. Make sure that the LoadFile call is BEFORE the Init call, if it's not, and the user gives a wrong filename, he will end up with a locked-up computer (which he will probably throw out the window, and charge you...). 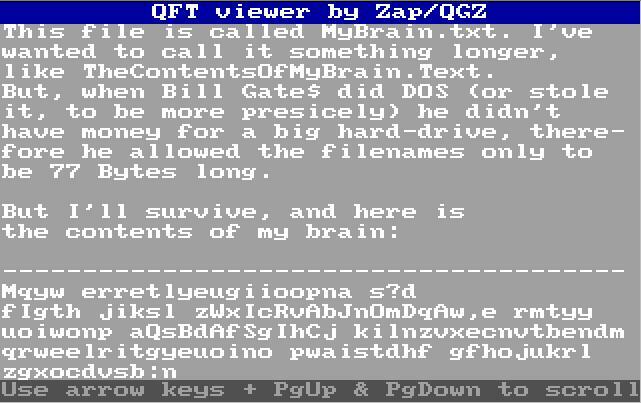 Copy & Paste this into NotePad, save it as QFTView.bas in your Viewer dir, open it in QB 4.5, compile it, and run it. Try it with different parameters. You might notice that if you run it with a wrong filename, it'll come up with a strange error. Now you expect me to correct it right? NO! This is an EXERCISE for YOU to make. Make the program show a FRIENDLY error msg when run with a wrong file name. The best entry (Friendliness and best & future friendly coding) will be shown in the next part of this article (in the next issue of QBCM). So... Guess this is the end of this part... *SNIF* ... Well... Mail me with any complaints, greets, ideas for next part (have some myself, but more's needed), or anything else about this article. You could of course also go to the QbasicNews Forum and post there. PS: Yes, I know I didn't teach any formatting this issue, but after writing 500 lines of HTML code, I decided that it would just have to wait.